The Iran Primer– Foreign policy and nonproliferation experts issued a range of reactions to President Trump’s decision to withdraw the United States from the Iran nuclear deal. Some critics of the accord thought the move was risky. “I would’ve preferred to see a US-E3 agreement first,​​​​​​” Mark Dubowitz, CEO of the Foundation for Defense for Democracies said. “I certainly understand President Trump’s motivation but it’s a big risk,” said David Albright, a former U.N. weapons inspector. Supporters of the Joint Comprehensive Plan of Action (JCPOA) said U.S. credibility had been damaged. “This is the most devastating and destructive act of Trump’s presidency,” Joe Cirincione told MSNBC. The following are reactions from experts on Trump’s decision. Today, Trump decided on a nix instead. It remains to be seen whether that strategy will actually include the effective implementation of a maximum pressure campaign (for example, how does this square with Trump’s desire to leave Syria?) — and whether “nix to a fix” will work. I have concerns. It’s a high risk strategy with potentially big rewards if it can be successfully implemented but dangerous consequences if it isn’t. I would’ve much preferred to see a US-E3 agreement first. This would have put the US in a stronger diplomatic position. I think the US & Europeans were close to getting this done. In the meantime, I agree with President Macron about the importance now of working on a broader framework based on pre and post-2025 nuclear issues, missiles, and regional aggression. Trump doesn’t seem to understand or simply doesn’t care to understand how difficult it has been to build and sustain a coordinated approach to address Iran’s nuclear program. Instead, he’s keen to blow up years’ worth of diplomacy without offering a viable alternative. Our European allies spent years working on the complex diplomatic processes that eventually led to the #IranDeal. They will view this reckless move as a crisis of Trump’s making – an “unfriendly act” that puts their national security at risk. Trump’s wrecking ball approach shows an inability to grasp statecraft. 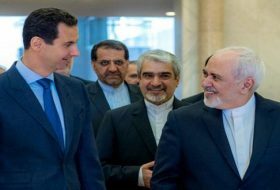 Instead of destroying a working deal, he should use the leverage he would gain by following through on commitments to pursue talks w/ Tehran on its activities that run counter to US interests in the region. “To Trump’s credit, he has chosen not to ignore the deal’s counterproductive sunset clauses, which make restrictions on Iran temporary. He hasn’t ignored that Revolutionary Guard bases, where we know Iran has engaged in nuclear-weapons research, are now effectively off-limits to inspectors. “He is not ignoring the regime’s development of long-range ballistic missiles that only makes sense if armed with atomic warheads. 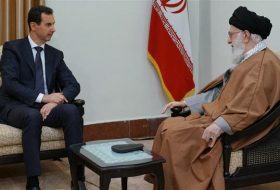 He is not ignoring the strategic and moral absurdity that monies delivered to Iran under the deal abet Tehran’s imperialism, especially its savage campaign in Syria, which has now claimed hundreds of thousands of lives. “Multilateralism does build symbolic legitimacy, but unilateralism often brings the most effective change. There will be no break with Europe. The sanctions on Iran’s Central Bank which Trump now reimposes mean that European leaders have a choice: trade in rials or in dollars, but not both. No European government is willing to sacrifice hundreds of billions of dollars in trade to stand in solidarity with the Islamic Republic. Don’t take my word for it? Ask Bill Clinton: It was Clinton who, beginning in 1994, issued a number of executive orders and in 1996 signed the Iran Libya Sanction Act, which together imposed unilateral on Iran and applied them in an extraterritorial manner to European companies willing to flout them. 2. Iran’s restraint isn’t surprising. The name of the game for Tehran was & remains: winning the international blame game. 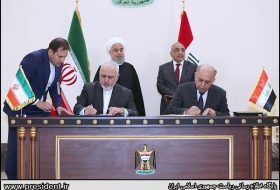 I expect Tehran to trigger the deal’s 35-day dispute resolution mechanism to drive this point home & get US condemned by other signatories to the deal. “Of all the options that Trump had before him today, he chose the most hard-line position of withdrawing from the Iran nuclear deal altogether. He could have softened the blow. He could have tried to portray some middle ground, suggesting to the Europeans, for example, that there would be several months before any penalties would be imposed so there was still time to try to improve the deal, but he held out no such hope. This is it. He’s pulling out of the Iran nuclear deal and now the ball is in Iran’s court. 4. History has shown that Iran responds to pressure when it is encircled with a united international front. Unilateral U.S. pressure, however significant, is less impactful if Tehran feels it has escape doors in Europe, Russia, and Asia. “After months of speculation and a flurry of last-minute European diplomacy, Donald Trump has taken perhaps the most consequential decision of his unconventional presidency with the Tuesday announcement that he is re-imposing U.S. sanctions on Iran in a deliberately provocative breach of the 2015 nuclear agreement with Iran. 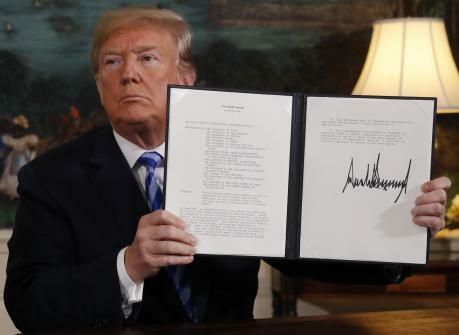 By torpedoing U.S. adherence to the accord, Trump has all but guaranteed its collapse, a move that opens the door to the unfettered resumption of Iran’s nuclear program and unleashes unpredictable escalatory pressures in an already volatile Middle East. The premediated American dismantling of an agreement that was the product of more than a decade of intense diplomacy and economic pressure marks a staggeringly counterproductive step. That it was undertaken over the vocal objections of Washington’s closest allies and without a clear strategy of mitigating the newly heightened risks of Iranian proliferation and conventional retaliation represents an abdication of American leadership on the international stage that is unparalleled in recent history. 1/ Make no mistake, #Trump‘s decision on #Irandeal tonight to reimpose US secondary sanctions = US CHEATING & VIOLATION on a multilateral nuclear accord that has been seamlessly implemented over past year by Iran (as verified numerous times by US admin & IAEA). 2/ #Trump repeatedly tried to muddy waters regarding blame game over #Irandeal. In Oct decertification tried to pass buck to Congress (& failed). In Jan presented ultimatum to Europe “to fix” deal in effort to pressure Europe to fold & provoke Iran into violation (failed). Well ladies and gents its done. #Us withdrawing from #Irandeal and reinstituting the highest level of economic sanctions on #Iran. Biggest mistake ever. “We mustn’t be under any illusion: Trump’s announcement to walk away from the Iran deal achieves absolutely nothing. Rather, it makes everything worse. He discredits the nuclear deal, putting it on the path to destruction and potentially re-opening the doors to an Iranian nuclear program; he puts American credibility on the line; and none of this addresses any international concerns over Iran’s behaviour. This is crisis-creation at its finest. 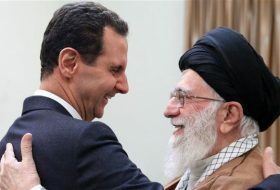 “There is always an implicit connection between an adversary’s regional behavior and the durability of a nuclear accord. … In the end, the Islamic Republic could not implant its flag across the Middle East and aggravate Arab civil wars and sustain the JCPOA. Thus, in any future talks, the U.S. can’t allow Iran’s regional behavior to be excluded from consideration. Lets be clear: #Iran has 0 incentive to return to the table and negotiate on anything for foreseeable future. Missiles, region, human rights. Lets not fool ourselves. This is a major hard line win in Iran. We are disappointed that the United States was unable to reach agreement with its European partners on developing an agreement to fix key terms of the Joint Comprehensive Plan of Action (JCPOA). 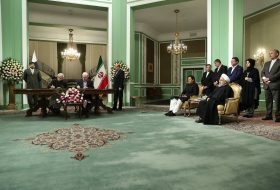 We hope that comprehensive negotiations begin soon with our European allies, and ultimately with Iran, on reaching a broader agreement covering the need for lasting limitations on Iran’s nuclear program, constraints on its development of long-range ballistic missiles, and better International Atomic Energy Agency (IAEA) inspections. In the meantime, the United States and its European partners need to continue pressing the IAEA to improve inspections in Iran, particularly in light of the revelations about Iran’s atomic archive and the on-going stewardship of that archive alleged by Israel. This is one area of the recent U.S./European negotiations that reached consensus. As long as Iran remains in the Nuclear Non-Proliferation Treaty (NPT), it has an obligation to answer the IAEA’s questions and allow inspectors access to military sites and personnel in Iran related to that effort. The new information raised by the archive will undoubtedly strengthen the IAEA’s hand in pressing Iran for access. A priority is ensuring that the IAEA gets that access. President Donald J. Trump has unilaterally withdrawn the U.S. from the Joint Comprehensive Plan of Action (JCPOA) and announced the reimposition of sanctions against Iran. Since January, when President Trump declared that he would pull the U.S. out of the nuclear agreement with Iran unless Congress and Europe addressed several “disastrous flaws”, the UK, France and Germany, collectively known as the E3, made significant progress toward accommodating the White House’s concerns. Iran’s compliance with its JCPOA obligations has been verified repeatedly by the UN nuclear agency conducting the most rigorous inspection regime ever negotiated. But these factors seemingly did nothing to dissuade President Trump from exiting an agreement he has had in his crosshairs since taking office in January 2017. In the wake of this reckless and unjustified decision, the priority should be to salvage the JCPOA without the U.S., and avoid the unwelcome prospect of a renewed nuclear crisis in a Middle East already in turmoil. The accord’s fate now primarily rests on the actions of Europe. While European efforts have thus far focused on how to keep the U.S. in the JCPOA, they must now shift to keeping Iran from getting out. 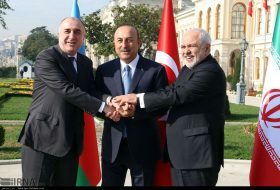 E3 leaders have been clear in their common commitment to upholding the agreement, even as they share concerns over aspects of Iran’s behaviour beyond the nuclear realm. As Crisis Group recently proposed, a JCPOA minus – with Russia and China, but without the U.S. – requires a political and economic commitment by Europe that preserves as many of the benefits envisioned by the deal for Iran as possible. 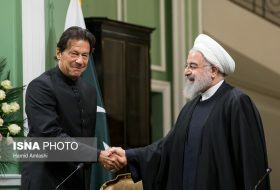 This could help Iranian policymakers justify restraint in the face of the U.S.’s withdrawal, and facilitate continued EU-Iran dialogue on issues such as Iran’s ballistic missile program, regional policies and human rights situation. President Trump’s decision to withdraw from the nuclear agreement is an irresponsible, unnecessary and serious blow to the JCPOA. 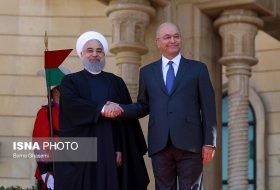 If Europe and Iran can find a way to work together, however, it need not be fatal.